Business Requirements. Written and Approved. Check. Functional Requirements. Written and Approved. Check. Seems like everything is covered. Except… where’s your traceability matrix? You have one, right? If you don’t, you’re missing one of the best tools for ensuring a successful project. Is each business requirement being implemented by a functional requirement? Is each functional requirement being driven by a business requirement? 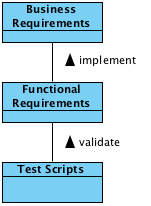 Is each functional requirement covered by a test script? What you can also see is that your project has some serious problems. BusReq4 does not trace to a single functional requirement. This reveals a gap in the project’s design. FuncReq6 does not trace to a test script. By creating a traceability matrix you can discover and correct a gap like this during the development phase, not during the expensive post-release phase. FuncReq7 does not trace from a single business requirement. Hmm…where did this requirement come from? If it’s not driven by a business requirement, what is it doing in this project? This is an indication of possible scope creep. We’ve just touched the surface of what a traceability matrix can reveal about your project. Future discussions of this topic will probe a little deeper into the rewards and risks of maintaining a traceability matrix. Robert Bedick is a senior consultant at Systems Flow, Inc. He started his career as an attorney (he's admitted to the bar in NY, NJ, WI, and RI) and then migrated into the world of software development in 1983 as a technical writer for a tax planning program that ran on an Apple II. Since then he has worked as a technical writer, programmer, and trainer in the domains of business valuation, credit card fraud, anti-money laundering (Certified Anti-Money Laundering Specialist 2008-2011), and electronic discovery. As an entrepreneur he is the successful author of a number of SQL Server and Oracle utilities, including: SchemaToDoc, QueryToDoc, and DB Side-By-Side. In addition to writing software, his novel Tomas can be found at Amazon.com. His current work for Systems Flow has him working as a business analyst for a major regional bank. For more details, please visit Robert's LinkedIn profile.